The film began as the thirteen-year-old Wei Minzhi arrived in Shuiquan village to substitute for the village’s only teacher (Gao Enman) while he was away on family business. When Gao discovered that Wei did not have a high school education and has no special talents, he instructed her to teach by copying his texts onto the board and then making the students copy them into their notebooks; he also told her not to use more than one piece of chalk per day, because the village is too poor to afford more. Before leaving, he explained to her that many students have recently left school to find work in the cities, and he offered her a 10-yuan bonus if all the students are still there when he returns. When Wei began teaching, she had a little rapport with the students: they shouted and run around instead of copying their work, and the class troublemaker, Zhang Huike, insisted that “she’s not a teacher, she’s Wei Chunzhi’s big sister!” The Mayor who happened to pass by heard it all and forcedly asked Zhang Huike to call Wei “teacher”. After putting the lesson on the board, Wei usually sat outside, guarding the door to make sure no students leave until they have finished their work. Early in the month, a sports recruiter came to take one athletic girl, Ming Xinhong, to a special training school. Unwilling to let any students leave, Wei hid Ming, and when the village mayor (Tian Zhenda) found Ming through the help of the troublemaker Zhang Huike, Wei chased after their car in a futile attempt to stop them. 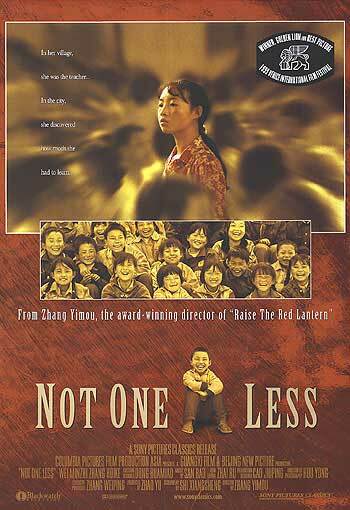 She still holds on the words of Teacher Gao that there should be “not one less”. One day, after trying to make the troublemaker Zhang apologize for bothering another student, Wei discoverd that Zhang had left to go find work in the nearby city of Zhangjiakou. The village mayor was unwilling to give her money for a bus ticket to the city, so she resolved to earn the money herself, and recruited the remaining students to help. One girl suggested that they can make money by moving bricks in a nearby brickyard, and Wei began giving the students mathematical exercises centered on finding out how much money they need to earn for the bus tickets, how many bricks they need to move, and how much time it will take. Through these exercises and working to earn money, her rapport with the class improved. After earning the money, she reached the bus station but learned that the price is higher than she thought, and she cannot afford a ticket. Wei ended up walking most of the way to Zhangjiakou. In the city, Wei found the people that Zhang was supposed to be working with, only to discover that they had lost him at the train station days before. She forced another girl her age, Sun Zhimei, to help her look for Zhang at the train station, but they did not find him. Wei had no success finding Zhang through the public address system and “missing person” posters, so she went to the local television station to broadcast a missing person notice. The receptionist (Feng Yuying) did not let her in without valid identification, though, and said the only way she can enter is with permission from the station manager, whom she described as “a man with glasses”. For the rest of the day, Wei stood by the station’s only gate, stopping every man with glasses, but she did not find the station manager, and spent the night asleep on the street. The next day the station manager (Wu Wanlu) saw her at the gate again, through his window, and let her in, scolding the receptionist for making her wait outside. Although Wei has no money to run an ad on TV, the station manager is interested in her story and decided to feature Wei in a talk show special about rural education. On the talk show, Wei was nervous and hardly said a word when the host (Li Fanfan) addressed her, but Zhang—who has been wandering the streets begging for food—saw the show. After Wei and Zhang were reunited, the station manager arranged to have them driven back to Shuiquan village, along with a truckload of school supplies and donations that viewers had sent in. Upon their return, they were greeted by the whole village. In the final scene, Wei presented the students with several boxes of colored chalk that were donated, and allowed each student to write one character on the board. The film ended with a series of title cards that recount the actions of the characters after the film ends, and describe the problem of poverty in rural education in China. 1) MODERNITY HAS A HARD TIME UNDERSTANDING THE IDEA OF OBLIGATION TO OTHERS, BECAUSE SELF FULFILLMENT IS THE OVERBIDDING OBLIGATION. “Modo” in Latin means, “now”: hence modernus or modern. There is nothing special about “being modern”. We are all in fact “modern”, since we are alive “now”. But the way they began to use to use this term in the 14th century had a very special connotation: it implied the rejectin of what had been received from the immediate past. Man felt self-sufficient, and unwilling to acknowledge any indebtedness: he wanted to find things out by himself rather than being taught, like the child who is too proud to ask for help. Among other things, the Renaissance was a time of economic prosperity with an increasing urge to enjoy the pleasures of life and to look down on the recent past, which could not be easily accepted as a teacher. Those “moderns” felt that they had nothing to learn from their forebears, that now is better than yesterday. This is typical of modern philosophy: a contempt for the past which is self-defeating, since it dooms itself to be despised in turn by tomorrow’s present. Man wanted to find the whole truth out of himself and by himself: neither God, not the Church, nor the world, nor history should teach me; I am the one to find out the truth by myself. For modernity, therefore, philosophy no longer consists in contemplating the reality created by God and drawing therefrom the rules for human conduct, but in providing power for man to master the world and use it for his own happiness. Many critics point out psychological and moral hazards of modern life – alienation, feeling of rootlessness, loss of strong bonds and common values, hedonism, disenchantment of the world, and so on. Likewise, the loss of a generally agreed upon definitions of human dignity, human nature, and the resulting loss of value in human life have all been cited as the impact of a social process/civilization that reaps the fruits of growing privatization, subjectivism, reductionism, as well as a loss of traditional values and worldviews. Some have suggested that the end result of modernity is the loss of a stable conception of humanity and/or the human being. Here, I will explain how modernity had a hard time understanding obligations. First, the modern self assumes an autonomy that seeks to reject the claims of authority, tradition, or community. Since he wants to attain this autonomy and liberty or freedom, he wants to break away from the bonds of those enslaving traditions and authorities. The modern self searches for personal therapy that only results in the subjective experience of well-being. The true, the good, and the beautiful are undiscoverable, so they are judged as not applicable to human experience. The modern self has moved from an emphasis on redemption of character to liberation from social inhibitions. Here, the desire of a person to be totally detached from any kind of obligations is clearly seen. He does not want to have obligations to others who are members of the community or society so the tendency is that he will break away from it. His selfishness and self-centeredness drives him to strive for independence so as to escape the enslaving power of obligations, responsibilities, and commitments. Identity is self-constructed through self-consumption of products of desire. His goal is just to satisfy his own passions for pleasurable things. The satisfaction of himself is the main point of his existence without any consideration to the happiness of others. It is a selfish and self-centered desire. This selfishness drives him to be more confined in his own and not to communicate or connect to the lives of others. This selfishness too gives him the idea or connotation that he is free from any obligation to his neighbor since he choose to live alone. Such claims about identity and truth call for a technical mastery of the environment, as well as a division between the public and private spheres of reality. Therefore, no one is free from the temptations of modern thought, as no one is free from selfish passion and pride. 2) AS ALFRED NORTH WHITEHEAD SAID, PHILOSOPHY IS A SERIES OF FOOTNOTES TO PLATO, WHICH MEANS, “PHILOSOPHY RULES OF THE GAME WERE MADE UP BY PLATO, AND WE ARE STILL PLAYING THESE RULES TODAY. NOW WE EXPLORE THE THEME OF THIS FILM FROM VARIOUS THEMES INSTITUTED BY PLATO. Plato has done it all. He has already built the foundations of philosophy and Alfred North Whitehead says that all we have now are just derived from the ideas or teachings of Plato. We just repeat what Plato has stated in the past. Sometimes, we claim an idea as ours but the truth is that you just derived your conclusion from something that you have heard or analyzed on to. We just add something – from our personal ideas or opinions – from Plato’s works but still, we have a basis for our conclusions and therefore a footnote to his works. From here, I could derive the idea of Plato that education is very important to save the young from the error of falsehood, prejudice, and sophistry to true value. Education also involves conduct, life, and care of the soul. Another is what Socrates has said that “the more you know, the more you do not know”. This is applicable to the case of Wei: in the village, she was the teacher. In the city, she discovered how much she had to learn. The m ore he went to the city, she found herself as unknowledgeable enough to become a teacher; that she still needs to learn so many things. In the scenes that were shown in the film, teacher Wei taught her students using the Dialectic – process of soliciting one’s idea to attain knowledge or wisdom or truth. Wei used this process of soliciting ideas to arrive at an answer when they were computing or calculating how much bricks they should carry or work on, how much time they will consume to finish the job, and how much is the transportation expense, and other things they solved mathematically in the class. Money is important throughout the film. Concerns about money dominate much of the film—for example, a large portion is devoted to Wei and her students’ attempt to earn enough money for bus tickets — as well as motivating them. Most major characters, including Wei, demand payment for their actions, and it is left unclear whether Wei’s search for Zhang Huike is motivated by altruism or by the promise of a 10-yuan bonus. Zhu Ying points out the prominence of money in the film created a conflict between traditional values (such as the implication that the solutions to Wei’s problems can be found through the help of authority figures) and modern, capitalist and individualistic society. Finally, the film illustrates the growing urban–rural divide in China. When Wei reaches Zhangjiakou, the film creates a clear contrast between urban and rural life, and the two locations are physically separated by a dark tunnel. The city is not portrayed as idyllic; rather, Zhang shows that rural people are faced with difficulties and discrimination in the cities. While Wei’s first view of the city exposes her to well-dressed people and modern buildings, the living quarters she goes to while searching for Zhang Huike are cramped and squalid. Likewise, the iron gate where Wei waits all day for the TV station director reflects the barriers poor people face to survival in the city, and the necessity of connections to avoid becoming an “outsider” in the city. Frequent cuts show Wei and Zhang wandering aimlessly in the streets, Zhang begging for food, and Wei sleeping on the sidewalk; when an enthusiastic TV host later asks Zhang what part of the city left the biggest impression, Zhang replies that the one thing he will never forget is having to beg for food. We see ourselves as having lost tradition, that is, that our behavior patterns, our rituals, etc., are all new and innovative, that we are not repeating the past. But in fact, the experience of modernity is, to live in traditional ways and to repeat tradition in unrecognizable forms living the quotation “footnotes to Plato”. Modern cultures still perform traditional rituals, such as sports (which are originally religious rituals) or shaming rituals, yet the origin and original meaning of these rituals have passed out of the culture. Modern cultures still repeat ways of thinking in the past—in fact, the bulk of modern culture is based on traditional ways of thinking repeated relatively unchanged—yet modern cultures tend to view these ways of thinking as innovations. Although we base our social groups on abstract categories, the structure and content of these social groups repeat the structure and content of kinship groups, in other words, we base our abstract social groups on principles derived from real, biological relationships; we do not, however, experience these social groups as real, biological relationships. So, in sum, modernity—the sense that the present is discontinuous with the past is an illusion—and this illusion creates modernity itself. What has changed is social memory; we have disconnected most of our practices and ideas from our collective memory of their origins and meaning. 3) EVERYONE’S PERSONALITY, PLATO CLAIMED, IS MADE UP OF THREE DISTINCT PARTS: REASON, SPIRIT, AND APPETITE. DISCUSS THESE THREE IN RELATION TO THE THEME OF THE FILM. As we have studied in Ancient Philosophy class, particularly in the discussion about Plato, the soul consists of three “parts” – the rational part”, the courageous or spirited “part”, and the appetitive “part”; and deep within a person, there is an experience of conflict between the reason and appetite. The reason seeks for what is valuable. It directs a person towards his goal or function. That is, to seek for what is truly good. On the other hand, the appetite desires for the things of the body. It seeks for what is pleasurable. At first, the spirited part is neutral. It is in between the reason and the appetite. But later on, the spirit goes toward the direction of the reason. Here, the analogy of the charioteer and the two horses can be used. First, the charioteer, who represents the rational part, gives the direction to the two horses. It controls both the spirit and the appetite. Second, the good horse represents the spirited part. It is the natural ally of the reason against the appetite. It stands for moral courage and loves honor, temperance, and modesty. Lastly, the bad horse represents the appetitive part. It is a friend to all riot and insolence or rudeness and tends to obey sensual passions. According to Phaedrus, it is used to be whipped by the charioteer. Since the conflict within a person is present and continuous, the rational part needs to discipline the appetitive part because not all sensual or pleasurable things will give a person happiness. In our lives, we use reason to evaluate what the appetite dictates us. We should choose what will lead us to what is truly good. Here, the peculiar function of the rational part is to seek the true goal of human life and this is done by analyzing the nature of things and to evaluate what is true and good. But in reality, the appetite drives us to what is pleasurable. The dilemma is that sometimes, we are fooled by the things that we think is pleasurable. In the film, this tripartite nature of the soul or of one’s personality claimed by Plato was clearly seen. The first scene I remember is when teacher Wei Minzhi hid Ming Xinhong from the mayor who wanted to take away the girl with a recruiter due to the athletic potential of the child. Teacher Wei hid the girl to hold on her promise to teacher Gao that there should be “not one less” student when he come back. When the Mayor could not find Ming Xinhong, he asked every student where the teacher hid the girl. When nobody wanted to tell the location of Ming, he secretly appealed to Zhang Huike, the class’ troublemaker to tell him where Ming Xinhong is hiding. At first, Zhang Huike did not want to tell where Ming Xinhong is because teacher Wei told the class not to do so. But because of the insistence and bribes the mayor offered, the boy finally confessed the location of Ming Xinhong. At this particular event in the film, we could see that there is a conflict deep inside Zhang Huike – that is to tell or not to tell where the girl was hiding. At first, with the help of the rational part, the spirited part seemed to be domineering. However, when the bribes the mayor offered entered the scene, which for me is the symbol of pleasure, the appetitive part took dominion over the child’s decision (soul or personality). 4) HOW DOES THIS FILM COMMUNICATE EVIL OR MORAL EVIL IN PARTICULAR? WHAT IS MORAL GOOD? WHAT IS MORAL EVIL? Plato’s moral philosophy states that “knowledge is virtue”.For him, unhappiness is not directly willed by man but it just happen that man doesn’t know what is pleasurable. It is losing the harmony of the soul’s tripartite nature. There is a struggle between apparent and real good. A man chooses what he knows or even what he thinks is good. Sometimes, it results to choosing the apparent good which causes moral evil. Knowledge for Plato is virtue: applying this to Christian Philosophy, sin is apparent good; while virtue is the real good. There should be an intellectual assent or moral assent to choose what to follow or what to do: to choose to do evil or to choose to be virtuous. Virtue is the fulfillment of function – that is the work that a thing alone can do better than anything else. A soul becomes virtuous when it has inner harmony. To be virtuous is to function effectively. If the soul’s parts function properly, it corresponds to 3 virtues: the rational part corresponds to wisdom if reason is the not deceived by the changes around; if reasons remain undisturbed by the appetite. The spirited part corresponds to courage that is when the will is kept within limits avoiding rush actions. And lastly, Appetite corresponding to temperance where in the desires is controlled and pleasures are moderated. There is actually a fourth virtue: a virtue obtained if each part of the soul functions properly; that is, justice. However, in the liberal side of me in answering this last question, is about my assigned Philosopher when I was in first year. In our Ethics class with Fr. Ernesto Fernando Placibe, I was assigned to talk or report about the ethics of Herbert Spencer. I learned to love Spencer because of his ethics. For Herbert Spencer, happiness reflects the complete adaptation of an individual organism to its environment–or, in other words, ‘happiness’ is that which an individual human being naturally seeks. For human beings to flourish and develop, Spencer held that there must be as few artificial restrictions as possible, and it is primarily freedom that he saw as promoting human happiness. While progress was an inevitable characteristic of evolution, it was something to be achieved only through the free exercise of human faculties. Spencer saw this analysis of ethics as culminating in an ‘Absolute Ethics,’ the standard for which was the production of pure pleasure–and he held that the application of this standard would produce, so far as possible, the greatest amount of pleasure over pain in the long run. There is, however, more to Spencer’s ethics than this. As individuals become increasingly aware of their individuality, they also become aware of the individuality of others and, thereby, of the law of equal freedom. This ‘first principle’ is that ‘Every man has freedom to do all that he wills, provided he infringes not the equal freedom of any other man’. One’s ‘moral sense,’ then, led to the recognition of the existence of individual rights, and one can identify strains of a rights-based ethic in Spencer’s writings. This is what i loved of Spencer. That he believes that all men are free to exercise their human faculties namely will and intellect. This freedom leads man to discern for what he shall do. As i put it in my own words, “My freedom stops as freedom of others begin”. Wikipedia: Lu, Sheldon H (2005). “Chinese film culture at the end of the twentieth century: the case of Not One Less by Zhang Yimou”. in Sheldon H. Lu and Emilie Yueh-Yu Yeh. Joseph M. de Torre, CHRISTIAN PHILOSOPHY; third edition, SINAG-TALA Publishers, Manila, 1980, pgs. 286-288. Rev. Fr. Ronnie Tuazon, Lectures on Plato from Ancient Philosophy class. Posted on December 3, 2009, in Education and Teaching, Film Analysis, Uncategorized. Bookmark the permalink. Leave a comment.